Washington, DC, 18 August 2015 – The White House announced today federal regulations to reduce 2025 methane emissions from oil and gas production by 40 to 45% from 2012 levels. Methane is a short-lived climate pollutant (SLCP) and has the potential to quickly slow near-term climate impacts by reducing the immediate damages of climate change, including sea-level rise and extreme weather conditions. Aggressive SLCPs cuts could avoid up to 0.6°C of warming by mid-century, a significant part of the mitigation needed to keep the planet from warming more than 2°C above pre-Industrial levels. SLCPs (which include black carbon, hydrofluorocarbons (HFCs), and tropospheric ozone) will reduce the rate of warming within days to a decade and a half of implementing mitigation actions, unlike emissions reductions of CO2, which are necessary but won’t reap benefits until many decades after implementation. For example, SLCPs can provide 71% of avoided sea-level rise by 2100 from an aggressive mitigation strategy of both CO2 and SLCPs. 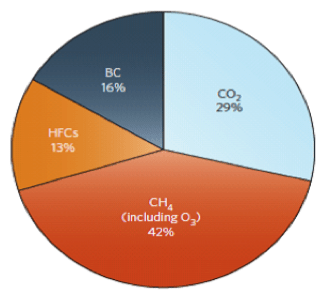 The biggest avoided sea-level rise percentage contribution of 42% will come from methane (see pie chart below). “Avoided sea-level rise at 2100 due to aggressive mitigation of long-lived CO2 and SLCPs. Such aggressive actions can reduce the rise in sea levels by 35 cm (uncertainty range is 17–70 cm) from the projected sea-level rise of 112 cm (49–210 cm) under a business-as-usual scenario for emissions (Representative Concentration Pathway (RCP) 6.0). The pie chart shows percentage contribution of each pollutant. Mitigation of the SLCP methane would lead to reductions in tropospheric ozone, another SLCP, and hence the pie chart includes both. As a long-lived pollutant, CO2 plays a substantial role (blue section), but reduction in SLCPs (shown in darker colours) would lead to a larger degree of avoided sea level. (Under a more intensive business-as-usual RCP8.5 level, reductions in CO2 would increase the share of CO2 mitigation to 50%).” David G. Victor, Durwood Zaelke & Veerabhadran Ramanathan (2014) Soot and short-lived pollutants provide political opportunity, Nature Climate Change Commentary.